! 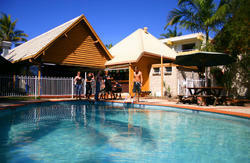 !Check out our amazing Fraser Island specials under the 'specials' tab!! We are a 10 minute drive to the magnificent, World Heritage Listed Fraser Island. Choose our four wheel drive self drive Tag-A-Long camping safari, meet great people and explore Fraser Island without the restrictions of a tour schedule. 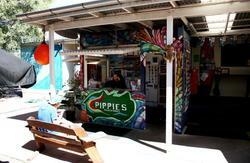 Trips depart daily from Frasers on Rainbow Beach Adventure Resort. 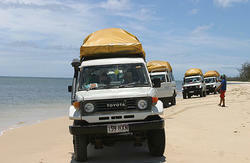 We ensure that all groups are like minded and compatible in our self drive safari's. With over 10 years experience, we will offer you the best prices in town and our friendly staff will brief you on 4x4 driving. See the World Famous Coloured Sands on our FREE guided bush walk. Learn how to throw boomerangs, sandboard the dunes, learn about local flora and fauna and watch the spectacular sunset from the Carlo Sandblow. We are a 2 minute walk to shops, cafes, restaurants and the beach. Frasers on Rainbow offers a range of Queenslands finest adventure based activities from skydiving over the amazing Fraser Island, dolphin feeding and kayaking, surf lessons to eco-tours and packages designed to suit your needs. We also offer Island style accommodation with a swimming pool surrounded by tropical gardens, a licensed bar, nightly entertainment and $10 meal specials daily. Imagine Byron Bay with MUCH less people and you have the magnificent Rainbow Beach, so why not follow the rainbow and come check us out. Driving north, take the Rainbow Beach / Tin Can Bay turn off before Gympie. Driving South, travel via Maryborough and follow the Rainbow Beach / Tin Can Bay signs. Simply hop off the Greyhound or Premier bus service!! If you are going North from Brisbane or Noosa or travelling south from Airlie beach, the buses will drop you right on our doorstep ! Too easy!! Only 2.5 hours north of Brisbane and 45 minutes north of Noosa, Rainbow Beach, the Gateway to Fraser Island offers rolling surf and Kilometres of unspoilt, white sandy beaches. This coastal village has so many attractions that it has become an eco-tourism destination in its own right.